This house was built in 1730. Roofs, floors, doors and windows originals. Rooms, with shared bathroom (hot water), are provided with air conditioners and vents. Hall and internal corridor, dinning room, kitchen full equipped and a central yard, provided with chairs and tables where you can rest, take sun bathing or you may order breakfast or meals, decorated with ornamental plants and tropical birds. 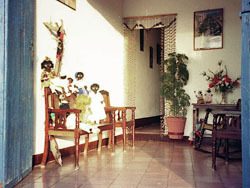 The house owner is a lady that works as an artisan, making (hand made) dolls of the Yoruba religion. This house is located in front of Plaza Mayor, 700m from the shopping area and Cespedes Square.